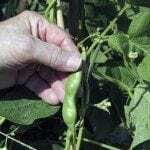 My new bean plants, 10 out of 14, the leaves are turning yellow and wilting. Am I over watering or not enough? Water after planting until the top 2 to 3 inches of soil are damp. 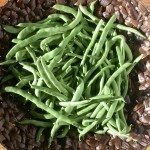 Then once established in the garden, your beans need at least an inch of water per week. They should not be allowed to dry out but also cannot tolerate soggy soils. Overwatered plants will generally turn yellow (especially lower leaves) and wilt.